If you had to choose one thing to believe in and defend its validity in today’s world, what would it be? In From Dusk to Dawn six characters trapped in an isolated inn on the edge of a cliff at the turn of the millennium make up a game to play until they’re rescued. From Dusk to Dawn explores the nature of personal belief and its effect on strangers and loved ones. In the process, relationships teeter and family secrets are exposed. Over the course of twelve hours, a British ex-military man and his wife of thirty years, a New York surgeon and his artist lover, a recently jilted thirty-year-old lawyer and a twenty-year-old waitress who isn’t always what she appears to be, come to understand that belief often has nothing to do with truth. Literally a cliff-hanger, From Dusk to Dawn will keep you on the edge of your seat and inspire you to think about what you believe in as opposed to believing in what you think. Originally from England, Maggie Barrett is a writer and artist currently living on a farm in Tuscany with her husband, the photographer, Joel Meyerowitz. 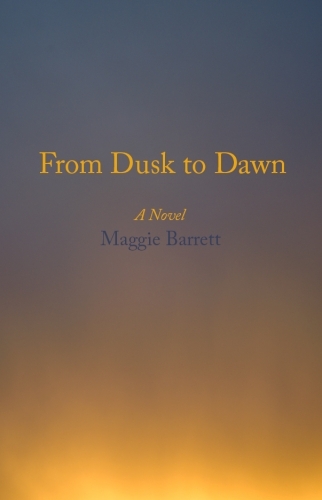 The author of four novels, a collection of short stories, and the play Give It Up, which she performed Off Broadway, Maggie is currently working on a collection of essays.